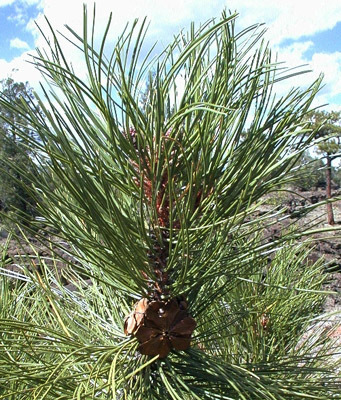 Overview of ponderosa pine Pinus ponderosa. Photographed at in El Malpais National Monument, 2005. 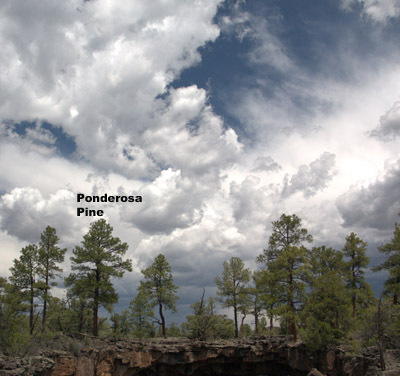 There are several mature ponderosa pines in this picture, but the most easily discernible one is the one under the text. Closeup of female cones of ponderosa pine Pinus ponderosa. 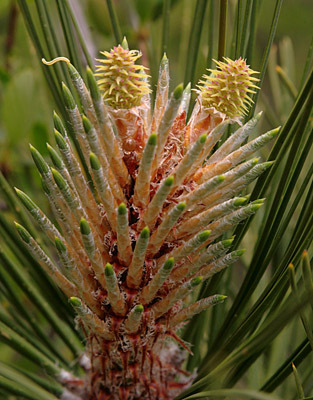 These are younger female cones than those seen in the next photo. Photographed at El Malpais National Monument on May 7th, 2005. Closeup of slightly older female cones of ponderosa pine Pinus ponderosa. Photographed at El Malpais National Monument on September 16th, 2000. Closeup of the end of a branch on a ponderosa pine Pinus ponderosa. 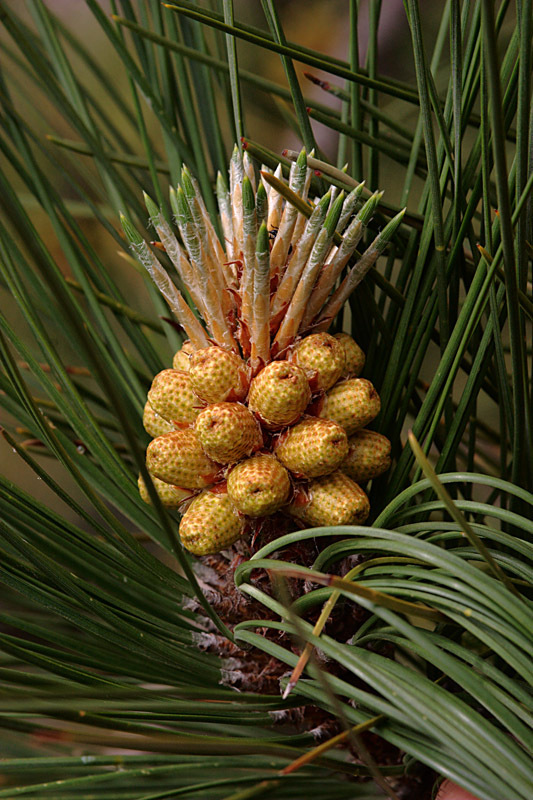 Notice the partial mature female cone. Photographed at El Malpais National Monument on September 16th, 2000. 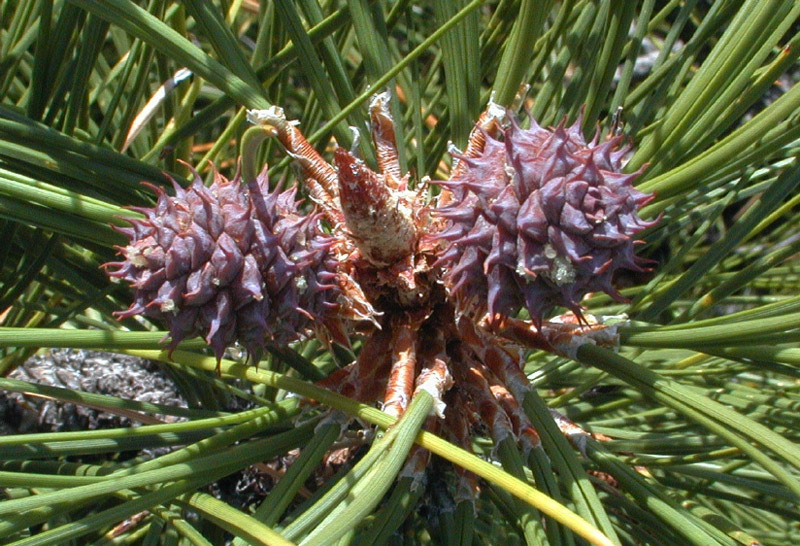 Closeup of male cones of ponderosa pine Pinus ponderosa. 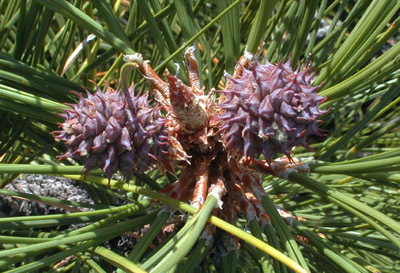 Note the different shape of these cones from those of the female cones. Photographed at Aguirre Springs on the Pine Tree trail on May 7th, 2005. 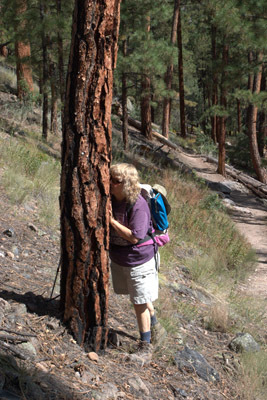 Overview of the bark of ponderosa pine Pinus ponderosa. Diana is spelling the vanillin, a compound produced by these trees that is very prominent when you spell the bark--a fun thing to do, especially on a hot summer day. Photographed at in the Jemez at Battleship Rock along the trail to the hot springs on October 14th, 2007. Copyright © 1997-2018 Kenneth Ingham Consulting, LLC. For details about the copyright, see the full Copyright statement. Unhappy? Thinking of suing us? Read this disclaimer. You can read our privacy statement. Comments? Send them via the suggestion form.